Once you know how to splice electrical wire in your house, a world of possibilities is opened up. 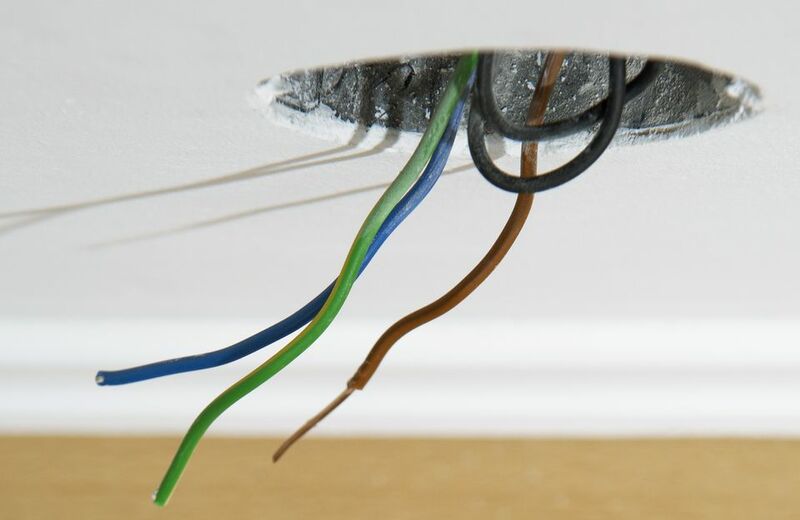 Wire splicing allows you to remove or move a wall, add an outlet, move or add a ceiling light, refinish an existing space like a basement, tame dangling wires, and countless other activities. Spliced wires are not held together with electrician's tape. They are never left on their own in the wall cavity or ceiling. Instead, all splices are contained within a junction box, individual wires attached with wire nuts. The junction box provides a safe environment for your splices, protecting them against impact and containing sparks and fire if anything should go wrong. While junction boxes may at first seem unwieldy and unnecessary, you will find that they are easy to work with and will make your work safer. Plus, they are required by Electrical Code. Make sure that you are joining two "like" cables. Each cable must be the same in terms of the number of individual wires within the casing and the gauge (thickness) of those wires. Modern wiring (even up to 50 years old or so) will have the gauge and number printed on the side. A common example is to join 12/2 Romex wire to 12/2 Romex-style wire. The "12" refers to the gauge, or thickness, of the wire. The "3" refers to the number of wires within the casing excluding the bare ground wire. Before you proceed, turn off the power to both wires at the service panel (fuse box). Expose the wires within the tough outer plastic casing. Do not use a utility knife, as you risk cutting into the individual wires. Instead, use a cheap tool called a cable ripper. Insert the cable into the hole on the cable ripper until it is about 6 inches in. Lightly press the ripper together and pull quickly back. Remove the casing and paper completely by cutting it off with scissors or utility knife. Every wire, except for ground, will be plastic-coated. Use your wire stripper to remove the coating to about 1/2" back. This is how your wires should look after you have stripped off both the outer casing and the coating for individual wires. With a screwdriver, knock out two opposing plugs from your metal junction box. Use your pliers to pry off and completely remove the plugs. Dispose of the plugs. Screw the wire clamps onto the junction box. Use your pliers to tighten the clamps onto the box. Do not turn too hard or you may break the clamps. Insert one cable into the junction box, through the clamp. Make sure the cable is positioned flat on the clamp. Turn the screws on the clamp until the cable is secure. Repeat for the other side. The casing section of the wires should extend into the junction box about 1/4". With your pliers, twist together wires of the same color (red with red, white with white, ground with ground, etc.). Turn them clockwise. Turn the wire nuts clockwise over each set of wires. The last step is to run a third ground wire (bare wire) alongside the two ground wires shown here, and secure those three wires with a wire nut. The loose end of that third wire is then attached to the inside of the box by means of a screw. The junction box will have holes inside to allow you to screw it onto a joist, rafter, or other sturdy wood section of your house. Adding an extender to your cordless drill bit help you push the drill bit deeper into the box without disturbing the wires. Attach the cover securely ​to the box. Cover plates such as the pictured Arlington have a matte surface that allows them to be painted.